Thanks for the pic Dave! 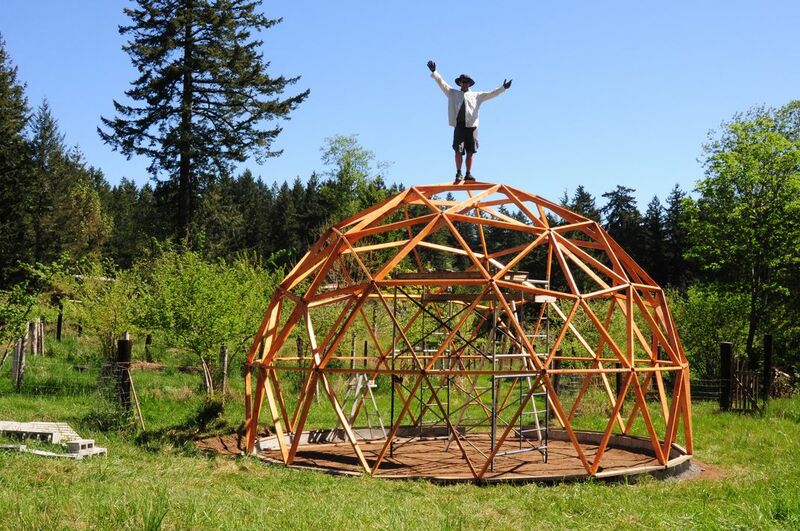 You’ve done your planning, decided on a location,considered options for foundations.Now it’s time to choose your geodesic greenhouse building material! Now, If you did not use the below method with your previous building projects, don’t worry – it’s not like its the end of the world! 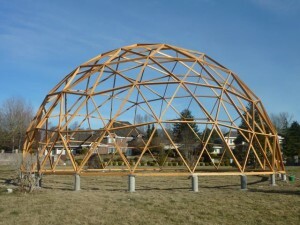 But my suggestion is that you definitely try to employ the following method with any other domes that you build. save you a ton of cash. So lets look at some options and a few pros and cons of each one. PVC stands for Poly Vinyl Chloride and it is generally used for water piping (irrigation, wells, septic fields, etc.). Pros: This material is pretty inexpensive, commonly available and easy to work with. You can do the math grab some pipe, make a cutting jig and prep your pipes with common hand tools. 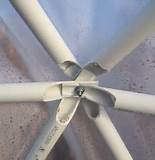 Another advantage is the fact that the pipe ends can actually become the dome connectors. Commercially available PVC dome connectors are available but, especially for smaller domes not necessary. Resists bugs, rot and moisture. Cons: High ecological cost. Made using fossil fuel. All plastic type materials have some issues generally due to becoming brittle over time due to extremes of cold or from ultraviolet damage. So if your biodome greenhouse is kept in use (warm) and the pipes are protected from UV this material could be a good choice. Pros: By using galvanized electrical “conduit” piping available at any big box home improvement store you have access to a durable, strong and easily worked material. Resists bugs, rot and mold. This pipe is available in a number of diameters and comes in ten foot lengths so make sure your design is optimized for maximizing material out of a ten foot pipe. With steel pipe you don’t need dome connectors because the pipe ends are, drilled and bolted together thus becoming the dome connectors. Cons: Medium environmental cost. May have been recycled but also may have been processed by slave labor in the developing world. Heavy. Can be expensive. Need specialized tools (hydraulic press) to flatten the ends prior to drilling. You can do it with a hammer but it is VERY hard work and easy to screw up. Steel can rust so painting any areas that have been cut or drilled. Pros: Light. Renewable resource. VERY green. May be locally available (depending on location and climate). Very strong. Bamboo scaffolding used in Asian countries is often still standing after a hurricane has destroyed the steel building the scaffolding was being used to build! 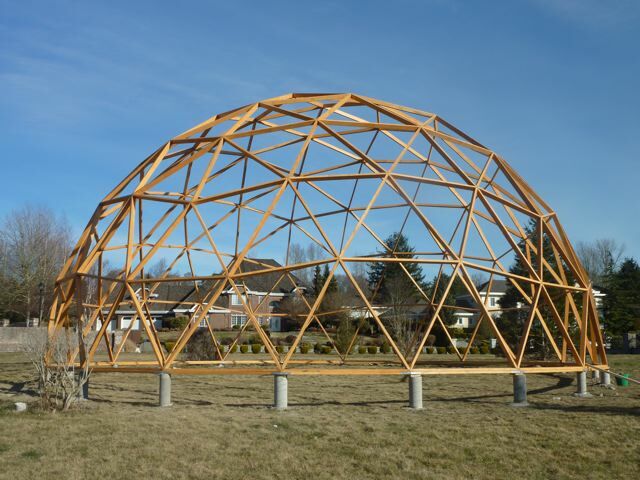 There are some ingenious domes being built using bamboo, either in whole pieces (treated like pipe) or split and almost woven together. Cons: Can be hard to impossible to find locally. May be very expensive to buy the required amount. Need specialized skill to build with it. All natural building materials have “quirks” that can be overcome when you know what you are doing. But if you don’t…. it can get painful. Trust me I speak from experience. Bugs can eat it. Again proper green treatment will keep bamboo going strong for longer than we will be around. Pros: Wood is almost universally available. There is some kind of wood that can be used for building in pretty much every place I have ever been. 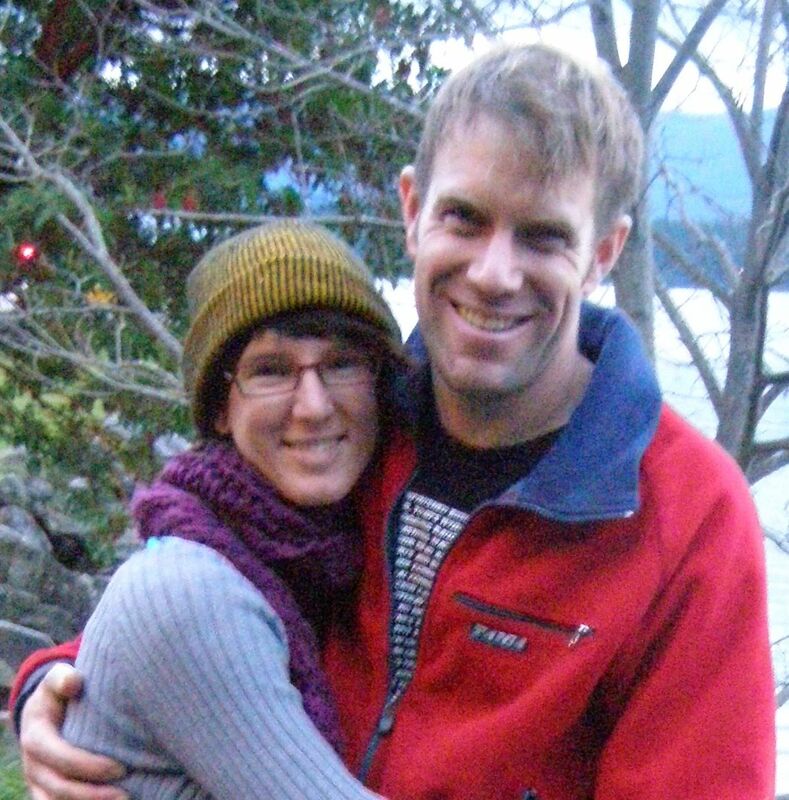 Green and renewable if harvested sustainably. Easy to work with. Lots of infrastructure already in place. Most people know a carpenter who has tools skills etc. and can be leaned on as a resource. Tools are also readily available at many stores. Durable if done properly. Smells good and is a pleasure to work with! Cons: Can rot so needs to be treated, luckily there are numerous environmentally sound ways to preserve wood on the market now. May split, break, or otherwise fail. This can be almost entirely avoided by proper use of tools and by choosing sound wood in the first place. Bugs can eat it. Again proper green treatment will keep wood solid for generations. So there you have it. A few ideas of biodome greenhouse building materials. 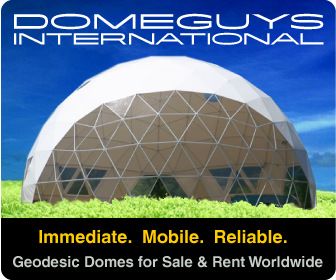 Look at your needs, your budget and your ecological footprint before you choose your dome building material because once you have 80+ pieces of any material sitting in your garage its a bit late to change to change your mind! Until next time happy biodome building! 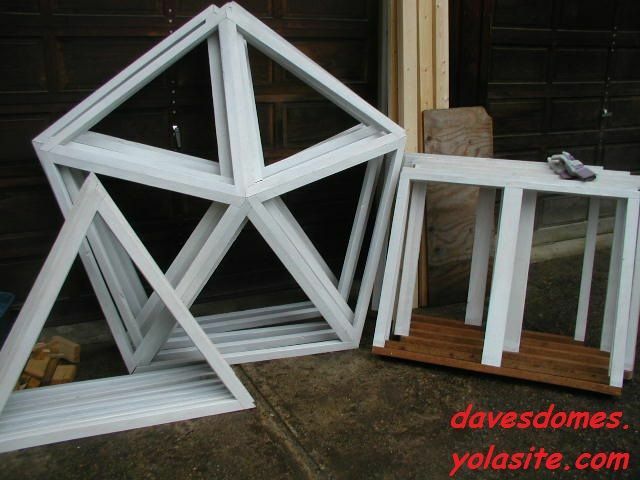 This entry was posted in Geodesic Dome Construction. Bookmark the permalink. If we were to use the steel pipe for our biodome, how would you attach the sola wrap. I’ve seen the cambia t-locks for the wood but don’t understand how you would attach it with the pipe. Can you give me what we would use please!? If you decide to build your biodome with pipe rather than wood I would still suggest adding a wood element to your pipe for attaching things both inside and outside. I haven’t done this style of dome yet but a dado blade on the tablesaw sized to create a channel that would fit your pipe then a couple of 1/8″ bolts (counter sunk of course) to attach the wood to the metal. 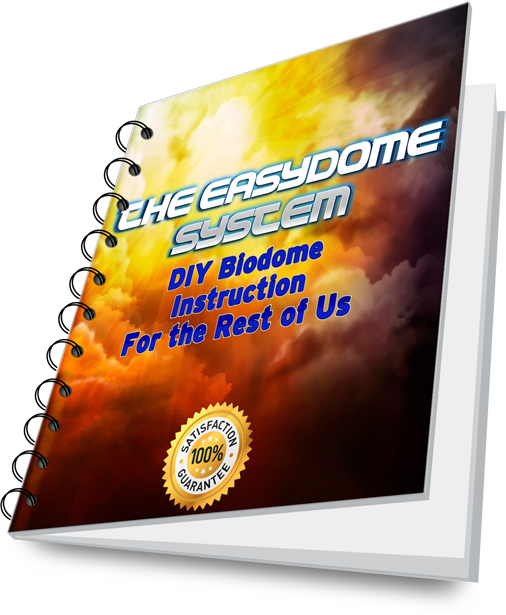 It would add to the cost but you would end up with a super strong super durable super cool bidome greenhouse!